Astral Dynamics - What Is NEW? NEW is a simple yet powerful method of directly simulating your energy body with your tactile senses - a true armchair system. It is easy to learn and to use. The majority of students move energy well and experience noticeable energy movement sensations during their first practice session. Energy movements are felt with a variety of predictable sensations, including warmth, tingling, heaviness, tightness, bone deep tickling and buzzing. The human energy body can be likened to a subtle reflection of its physical counterpart, including central nervous and circulatory systems and major organs. The energy body contains several interdependent energy systems. The primary circuit (containing major charkas) is the higher energy circuit responsible for all psychic and spiritual abilities. But this cannot be properly used (barring natural ability) until its subtle underlying circuitry (secondary chakra system) has been developed. NEW is an easy-to-learn method for developing and strengthening the secondary and primary systems. The underlying principles of NEW can be found in all Eastern energy systems, like Qi-Gong, Tai-Chi, Yoga, and Tantra, albeit in obtuse and difficult to comprehend forms. But NEW Foundations has been designed completely for Westerners, using easily understandable Western terminology. Essentially, NEW is a tactile system (based on the sense of touch and 'feel') that utilizes focused body awareness actions to move energy through your body. In practice, when one's attention is focused in a specific part of one's body, that part becomes energetically stimulated. When this focus of body awareness is given motion-meaning, when one focuses on a specific body part and then moves that focus through the body-the underlying energy body structures of that area are directly stimulated. This body awareness movement causes energy body stimulation and development. In this way, energy can be moved at will throughout the body, and specific energy centers (chakras) can be targeted and directly stimulated. This stimulates higher levels of energy body functioning, opening the way to psychic and spiritual abilities. Rest your left hand on your desk or lap with palm up. * With the fingertips of your right hand stroke the whole underside of your left hand from wrist to fingertips repeatedly. While doing this, memorize the feel of the touch this movement produces in your left hand. * Continue stroking for half-a-minute, until you can reproduce the feel and movement of this action in your left hand from the touch memory, with your mind alone. 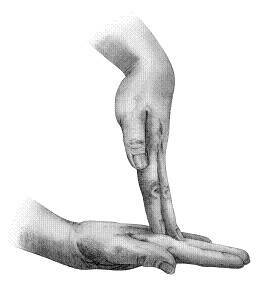 When you can do this, stop physically stroking and continue moving this feel through the whole of your left hand. * Continue this and you will begin to feel some peculiar sensations, like pressure, heaviness, tingling, buzzing, or tickling. * These indicate successful energy body stimulation in your left hand. Repeat the above exercise with your right hand, then with each foot, then with other parts of your body. Remember, the key ingredient to making this work is to move your sense of 'touch' and 'feel' through your body. Hold your hands out in front, palms facing, 12 inches apart. Imagine and 'feel' that you have a tennis ball sized globe of energy held in the right. Next, bounce this ball between your hands, without moving your hands. Imagine and 'feel' this ball bouncing from palm to palm. Keep doing this for half a minute, then extend the bounce action so the ball is passing 'through' your hands, several inches each side. Repeat the above exercise with the soles of your feet, by resting your feet on their sides, 12 inches apart, roughly facing each other. Repeat this exercise with your knees, then your elbows, then your ankles. Note the sensations that each exercise produces in your body. The NEW Energy Ways system builds upon the above demonstration exercise with easy and progressive steps. Larger and deeper parts of your energy body-including the primary chakras-are thus stimulated and exercised. Regular practice of these methods significantly increases energy body activity, thereby accelerating psychic/spiritual development.